Angolae, offeecially the Republic o Angolae (Portuguese: República de Angola, pronounced: [ʁɛˈpublika de ɐ̃ˈɡɔla]; Kongo: Repubilika ya Ngola), is a kintra in sooth-central Africae bordered bi Namibie on the sooth, Democratic Republic o the Congo on the north, an Zambie on the east; its wast coast is on the Atlantic Ocean wi Luanda as its caipital ceety. The exclave province o Cabinda haes a border wi the Republic o the Congo an the Democratic Republic o the Congo. Angola wis a Portuguese owerseas territory frae the 16t century tae 1975. Efter independence, Angola wis the scene o an intense ceevil war frae 1975 tae 2002. The kintra is the seicont-lairgest petroleum an diamond producer in sub-Saharan Africae; housomeivver, its life expectancy an infant mortality rates are baith amang the wirst ranked in the warld. In August 2006, a peace treaty wis signed wi a faction o the FLEC, a separatist guerrilla group frae the Cabinda exclave in the North, which is still active. 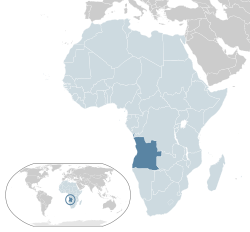 Aboot 65% o Angola's petroleum comes frae that region. ↑ 2014 population census (INE Angola) Archived 6 Mey 2016[Date mismatch] at the Wayback Machine. ↑ 2.0 2.1 2.2 2.3 "Angola". International Monetary Fund. ↑ "Gini Index". World Bank. Archived frae the oreeginal on 9 February 2015. Retrieved 2 March 2011. Wikimedia Commons haes media relatit tae Angola. This page wis last eeditit on 28 October 2018, at 16:20.